In December 2011, two groups of volunteers jointly visited Noda Village in Iwate Prefecture that was seriously damaged by the 2011 Great East Japan Earthquake. They were from different areas in Japan, both of which had experienced serious earthquakes in the past. One was from Nishinomiya City in Hyogo Prefecture which was affected by the 1995 Great Hanshin Awaji Earthquake, and is also the home town of NVNAD, and the other was from Kariwa Village in Niigata Prefecture which suffered the 2007 Chuetsu-oki Earthquake. During this joint visit, the volunteers from Kariwa Village were seen everywhere in Noda Village working hard to convey their compassion for the victims. Their sincere attitude was impressive. We, at NVNAD, have kept a relationship with the Kariwa residents ever since we engaged in rescue activities in the aftermath of the 2007 Chuetsu-oki Earthquake. As we saw the people from Kariwa working here in Noda, the images of the same people toiling in the disaster-struck Kariwa came back to us, overlapping with the scene. They used to say “Should anybody suffer a hardship like this in the future, we would like to be beside them and offer our support.” Now, they were putting those words into practice. This was a notable step forward in the “relay of support among the disaster-affected areas.” We appreciate their coming all the way from Kariwa. These volunteers visited each household at the temporary housing in Shimoakka to present sweets they had brought from Niigata. 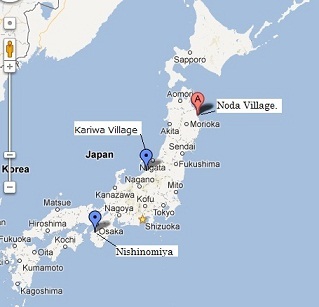 The residents of Noda and Kariwa got into conversation soon. From time to time, they shed tears together recalling the time of the disasters. In the evening, the people from Kariwa joined the monthly social event of the Team North Rias and the residents in the Izumizawa temporary housing. “Let’s taste and compare sake from Niigata and Iwate!” The party started merrily. The participants had a great time singing and chatting. Some were fully engaged in serious talks on topics like their experiences in the disasters. We were moved to witness the process of their socialization bearing fruit. As dinnertime drew near, there came Mr. H with his cheerful signature tune outside the community room. He serves authentic okonomi-yaki (pancake with meat and vegetables especially loved in Osaka area), calling himself “Naniwa Soemon XIII, an okonomi-yaki chef carrying on a 300-year tradition.” To give it a more authentic touch, he uses a special cast-iron plate bought in Osaka, and even has the ingredients including a special sauce sent in by air. The office manager of Team North Rias had arranged to invite him especially for this occasion. Authentic Osaka-style okonomi-yaki was served one after another. Encouraged by Mr. H, the participants from both Noda and Kariwa took turns to cook and serve okonomi-yaki. We could feel the effect of eating and especially cooking okonomi-yaki on sparking conversations and creating a friendly atmosphere. We would like to express our heartfelt gratitude to Mr. Naniwa Soemon XIII. This also happened to be the evening of a total lunar eclipse. We hope this evening’s experience will stay in the participants’ minds as a pleasant memory leading to another development. NVNAD and Team North Rias are starting to make an attractive plan for the monthly event in January. Our challenge now is to develop relationships with the residents who did not or did not want to take part in the events this time.